Click the picture to listen to the BBC Radio 4 interview. In the news yesterday, 10th March 2015, was a report about police in Lincolnshire threatening to confiscate a 4-year-old’s bicycle because she was riding it on the pavement. 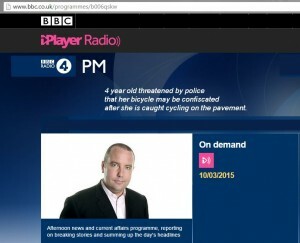 Eddie Mair, host of the BBC Radio 4 news and current affairs programme ‘PM’, interviewed Donnachadh McCarthy, co-founder of Stop Killing Cyclists, and Joe Irvin, Chief Executive of Living Streets, about the issue of police enforcement of pavement cycling. 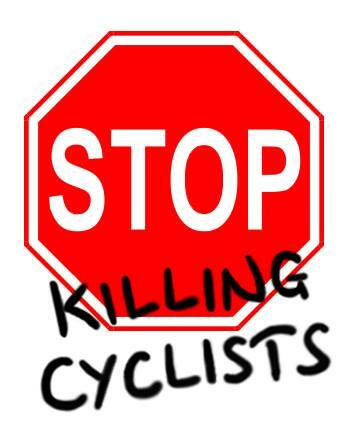 Note: contrary to the introduction by Mr Mair, the origin of Stop Killing Cyclists was to build a peaceful but more radical approach to fighting for safer infrastructure for all of the city’s road users; and last November it was part of the Stop The Killing coalition calling making 10 Demands, one of which is Stop the Killing of Pedestrians. What the policeman should have done was praise the parent for teaching the child to cycle in a non-dangerous way in a safe environment. It isn’t a conflict between cyclists and pedestrians that we really have in this country. It is a conflict between cyclists and pedestrians [together] and the HGV road users. The real problem in the UK is our politicians are refusing to invest in cycling safety: in Britain we spend £2 per person per year, in [the Netherlands] they spend £28. If we spent that on creating a network of physically protected, safe cycle routes across Britain then we wouldn’t be having this conflict between cyclists and pedestrians, we’d be on the same side. The root of the problem is unsafe roads, and things like bringing down maximum speeds to 20mph in urban areas would be a big move in the right direction. It’s no doubt at all that HGVs and cars are the biggest [cause] of deaths and fatalities and that’s for people on the pavement. On 9th January 2014, Robert Goodwill MP wrote to Donnachadh McCarthy to follow-up on points raised during a meeting he had with Baroness Susan Kramer earlier. In the letter, Mr Goodwill re-issued Ministerial Guidance on Pavement Cycling. Some of the statistics highlighted by Donnachadh during the program are noted by the CTC in their briefing document: PEDESTRIANS. Whereas each year, on average, there were 34 pedestrians killed by vehicles. And, the 34 deaths statistic rises to 1,245 when you consider pedestrians killed by people driving motorcars anywhere, not just on the pavement or verge. Whereas, there were 20,181 seriously injured by a person driving a motor vehicle. Heard you on radio yesterday discussing cycling on pavements. I feel that conversations about cyclists typically make the assumption that we are always in the wrong. I can cite lots of incidents where pedestrians have caused me problems by walking out into the road: like the morning when a >40 year old man walked out from between two parked cars causing me to pull on brakes hard and snap a brake cable. Or the morning when in a country lane and an old woman was vicious towards me because I disturbed her walking in the middle of the road….or the time when a woman with her child waiting to cross the road looked at me cycling towards them and then decided to walk out in front of me anyway. There is outrageous behaviour by pedestrians on the road, and hearing cyclists vilified is hard to take when I am polite and courteous, but am not afforded the same. In last night’s radio 4 PM programme, Donnachadh McCarthy ignoring the law and the safety of pedestrians, recommended permitting cyclists to ride on the pavement. What utter nonsense. He played down the consequences of this hazard by quoting a death statistic. I am one person – my husband had his elbow detached from his humurus, a colleauge sustained a spinal injury having to walk on crutches and an elderly neighbour was hospitalised all after being hit by cyclists on the pavement. When will you accept that cyclists can behave just as aggressively as the worst car and lorry driver and placing those in their path in serious danger. McCarthy appears to view all cyclists as Mary Poppins characters riding at a gentle pace, giving room to pedestrians. Try standing opposite Waterloo station in the evening when they are screaming through red lights ignoring anyone trying to cross the road. Get real – pavements are for walkers. Sorry your friends have suffered injuries, but anecdotal evidence does not trump statistics. It is quite correct that motorised traffic causes deaths and injuries many orders of magnitude greater than that caused by cyclists, or indeed other pedestrians. The reason people cycle on the pavements is the same reason you don’t walk on the road. I hope if you really care about the safety of all human beings, especially 4 year olds going to school, you’ll join in the campaign for a safe Dutch style cycle network that caters for all road users instead of just bitching and moaning about stereotypes. Because until we get a nationwide safe cycle network, I’ll continue to cycle on the unused pavement that runs alongside a 60mph A road, and I won’t apologise for it.